s we all know, there's an overabundance of smarts in the former Soviet Union. There you can find nuclear physicists who are willing to build nukes in exchange for a litre of vodka, a burlap sports coat, three or four potatoes, a turnip, and a place to sleep under a highway overpass. 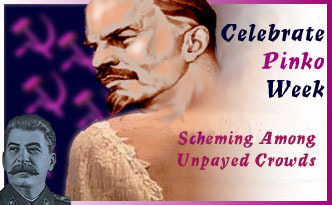 In some parts of Russia you can find Photoshop plug-ins for bargain-basement prices, although when I ran my latest "Celebrate Ginkgo Week" banner through the "May Day" plug-in, I didn't get the results intended. Looks like it's back to square one. here's been a weird problem in the Shaque of late. Something has been causing a steady trickle of sawdust to fall on the desk around Hoagie's Macintosh. It litters the mousepad, scanner and keyboard. The sawdust doesn't really cause as many problems as you'd expect, but it's still highly annoying. I've been unable to locate the source. It seemed to be coming from the oak beams above the computer (these beams had to be made of oak to have the strength to support the weight of the bunk without being so thick as to compromise vertical clearance in both areas). But I never saw the sawdust fall out of any obvious holes or cracks; I could only see the gradual scattered accumulation. I figured the dust was being made by a wood-boring beetle larva. There are, you see, species of beetles that lay their eggs in dead wood. Their larva tunnel through the wood, eating it and getting all the nutrition and water they need from it. But wood is not especially nutritious, so the beetles grow very slowly and take many years to mature. In adulthood, they're big and often spectacularly colourful. Different species favour different kinds of woods. Since there are rarely very many of them in any one board, the amount of structural damage they cause is minimal. Today I decided to take action against whoever was causing the sawdust. So I taped up Saran wrap to the undersurface of the bunk over a wide area. Before long I saw that dust had accumulated in a small pile on the plastic, right on the very edge of the bunk. It was coming out of a crack between two boards. As I watched the dust slowly accumulate, I finally saw the agent responsible, something I hadn't expected. It was not a beetle at all, but an ant, a very ordinary-looking black ant, the kind one often sees in houses. It was not especially large nor small, about 6mm in length. It was throwing sawdust out of the crack piece by piece and letting it fall onto the plastic. Since such ants do not themselves bore into wood, I concluded that this little guy was cleaning out an old borer hole, perhaps as a prelude to a nest expansion. It bears noting at this point that I think of ants as benevolent co-occupants. They control things like termites and rot, and, like me, they have a long-term interest in the continuation of the Shaque. I don't like them crawling on me at night, but I'd rather have them walk across my face than a Brown Recluse spider. Then I noticed something extremely interesting happening. In about ten minutes, the ants had picked up on the fact that when they threw out the sawdust, it fell only a short distance and landed on a new structure, the sheet of plastic Saran wrap. This evidently troubled them, because they had assigned one of their numbers the task of clearing the sawdust accumulation that was now forming on the plastic. That's right, now I could see an ant schlepping back and forth across the plastic with mandibles full of sawdust. The ant would take it to the edge of the plastic and release it into the abyss and go back for more. The job was evidently not a high priority, since only one ant was doing it. Now, I had to ask myself, why were the ants so interested in cleaning off the Saran wrap? I was forced to conclude that they were being thorough, that they didn't want to take the chance that the sawdust would build up on the plastic and eventually form a mound tall enough to block the entrance in the crack between the boards, some several inches above. To form such a mound would have taken an enormous amount of sawdust, but how else can one explain their insistence on throwing the stuff off into (what to them must have been) the bottomless void of the distant floor and computer desk (where, by the way, they were evidently content to leave it). I decided to put up another layer of Saran wrap, about an inch below the first layer, in order to catch the sawdust being cleared from the higher level. In a short time I noticed that yet another ant had appeared to clear the sawdust off the second layer. They were insisting, in their own way, that the sawdust go far, far away. I was very excited as I reported these findings to my mother and father, who both came up to witness the marvel. Here was obsessive-compulsiveness in the insect world, it was mind-blowing. We had to wonder how these various ants came to get their assignments and what thoughts were going through their heads as they made the group decisions we were seeing carried out. Humourously, of course, we imagined that orders were given in German, and that certain ants were higher up the chain of command and insulted their underlings with shouts of "Dumbkopf!Das Sägemehl akkumuliert auf dem Plastik! Sie müssen stark arbeiten! Sie werden jetzt das Sägemehl los! Vinyl zoluzion!" For now I've given up on controlling the sawdust. To see the work they're putting into their task gives me a great deal of sympathy for their plight. Whatever they are doing, it is their art and I should respect that, even if I don't understand it. They couldn't possibly understand what I'm doing right now either. I've been feeling more sympathy for insects in general lately. The other night I saw a great variety of moths gathered around the outside Shaque light looking like Muslims kneeling before the Hajar al-Aswad at the Ka'bah in Mecca during the Hajj. I thought about the instincts that had brought them there out of the darkness of the woods. Normally they'd be fluttering above the treetops in the dim light of the Moon hoping, like everyone, to find love. But here, at my light, all they could do was cling to the wall in between exhausting and fruitless bouts of slamming into a hot bright incandescent bulb. They didn't know why they were wasting their time. They're driven by a deep primordial calling, a flawed program that doesn't account for the existence of Man and his careless depletion of fossil fuels to light up the night. I wondered if any of these insects could reproduce at all in the confusing glow of the city. I recalled that in Charlottesville, no moths had ever come through my wide-open window. Perhaps there are no night insects in the city at all. How very sad. he day was incredibly hot, up in the mid-90s, and humid as well. In the bunk, it became just a little too warm for my computer, and I had to supplement its fans with a big 120 volt box fan set in front to blow air in over the motherboard. But I wasn't very happy with the situation. I want my computer to run cooler without help from external fans. So, as a thunderstorm threatened and blustered outside (without ever getting around to actually doing anything)I opened up the computer and did a little switcheroo of the processor's heat sink, replacing it with one several times larger (at least in terms of surface area, but also, to a lesser degree, in terms of mass). I had to reshape the heatsink a little to get the old processor fan on top of it, but when I was done, the computer ran without halting to cool down, even without a big external fan assisting. Of course, the air had overall air temperature had cooled a little by this point, but not too much. I was amazed to discover that the little remote control truck I picked out of a dumpster has a range of at least 300 feet. I'm thinking about building a much larger chasis powered by big motors scavenged from 8 inch floppy drives and using the electronics in the truck to control it. It would be very cool to build myself an industrial-strength remote-control robot. Of course, I'll have to do the roadtrip first. eya called today and we discussed splitting up the security deposit refund from Kappa Mutha Fucka. We'll probably end up giving Matthew Hart a token amount for his air conditioner (which we sold and then lied about). Meanwhile, Joanna Road Rage is in Charlottesville to (again) look for a house and a job. Tomorrow she's taking Jessika back to Malvern for the weekend so they can attend a special memorial for Shira, who died of a cocaine overdose back in December. In Shira's family, apparently, the memorial service is traditionally held after a six-month period of mourning has passed. As for Wacky Jen, well she's apparently joined the Batteau boat people, who every year float vintage river boats down the James River, pulling into ports along the way to throw Batteau Festivals. Jessika, Deya and I attended one such festival in Scottsville two years ago.